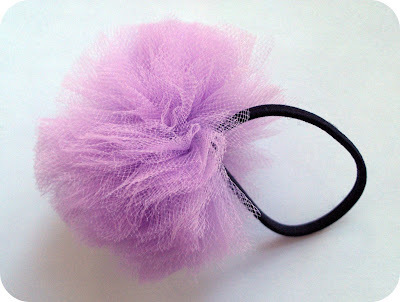 A while back I saw a pom pom made out of tulle on Once Wed (fabulous site by the way). 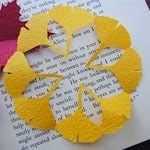 I loved the idea and knew I had to incorporate it into a craft. So the other day it came to me that they would make cute pony tail holders. 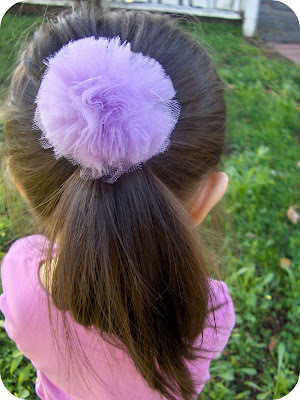 Simple directions below to make this hair accessory. First make a basic pom pom, you can find direction for that here. 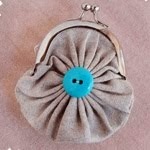 Next, just sew the pom pom to the pony tail holder. Done! This takes maybe 5 minutes to 10 minutes to make at the most. Oh what a fun (and easy!) project! Thanks so much for sharing this, I'll be linking. I know a little girl in my family who would love one of these. In every color. Cute. 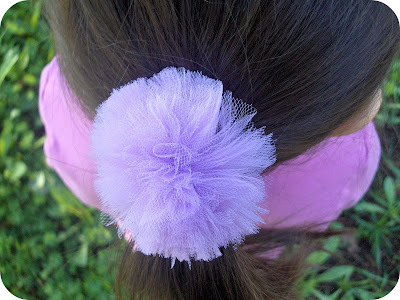 I am always looking for hair ties that match my daughter's clothes. Now I can just make a few. Thanks! I was off the island today and bought the supplies for these. I can't wait to make them. I love this idea. 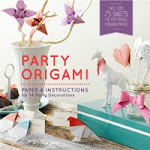 I am going to try it with ribbon offcuts and see if it works... I found you via freeneedle by the way.